Here’s a recap of some of the news articles featuring the Lee Kong Chian Natural History Museum. The lair of three rare dinosaurs opens to the public today, after more than five years in the making. Guests to the Lee Kong Chian Natural History Museum in Kent Ridge will not only get to see the genuine fossils of the three diplodocid sauropod dinosaur stars – Prince, Apollonia and Twinky – but also get the chance to “hunt” for bones. But instead of a hammer and chisel, aspiring palaeontologists (fossil scientists) need only a mobile application called App-ollonia, a play on Apollonia’s name. Developed by Singapore software firm mgg software, App-ollonia is free for download on iOS and Android devices. Using the app, museum visitors must first “collect” four of Apollonia’s bones – its skull, fibula (lower leg bone), cervical vertebra (neck bone) and coracoid (a bone near the shoulder blade). This is achieved by using the app’s camera function to scan the QR codes placed around the biodiversity gallery on the first floor of the museum. The QR codes show where the bones are hidden. The app also provides interesting facts about a particular bone when a QR code is detected. For instance, those who “collect” the fibula will learn that it is the part of the skeleton from which palaeontologists take samples to determine a dinosaur’s age. 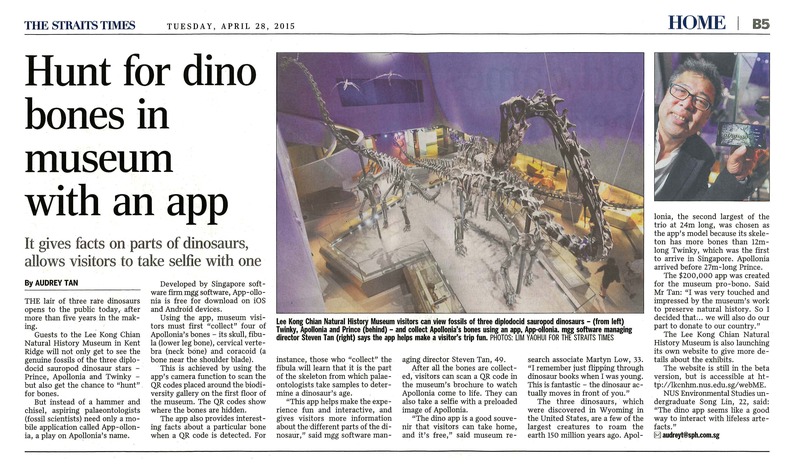 “This app helps make the experience fun and interactive, and gives visitors more information about the different parts of the dinosaur,” said mgg software managing director Steven Tan, 49. After all the bones are collected, visitors can scan a QR code in the museum’s brochure to watch Apollonia come to life. They can also take a selfie with a preloaded image of Apollonia. The three dinosaurs, which were discovered in Wyoming in the United States, are a few of the largest creatures to roam the earth 150 million years ago. Apollonia, the second largest of the trio at 24m long, was chosen as the app’s model because its skeleton has more bones than 12m- long Twinky, which was the first to arrive in Singapore. Apollonia arrived before 27m-long Prince. The Lee Kong Chian Natural History Museum is also launching its own website to give more details about the exhibits. The website is still in the beta version, but is accessible at http://lkcnhm.nus.edu.sg/webME. 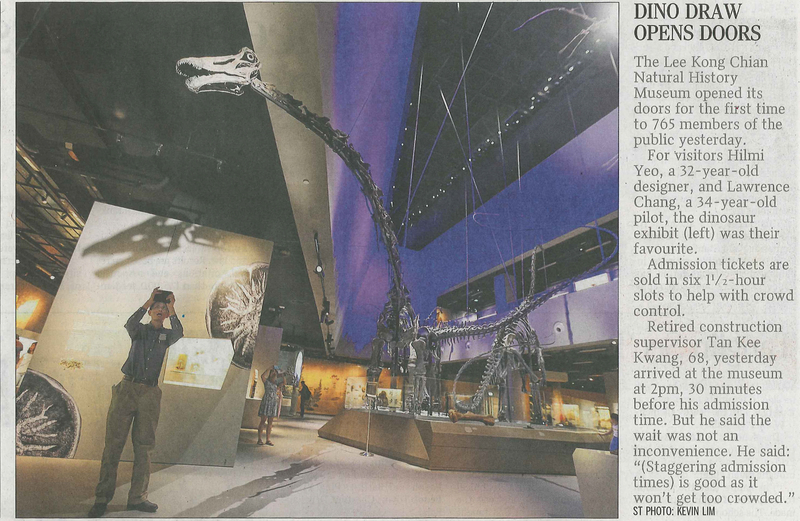 The Lee Kong Chian Natural History Museum opened its doors for the first time to 765 members of the public yesterday. For visitors Hilmi Yeo, a 32-year-old designer, and Lawrence Chang, a 34-year-old pilot, the dinosaur exhibit was their favourite. Admission tickets are sold in six 11/2-hour slots to help with crowd control. Sixty-nine heritage heroes receive the National Heritage Board’s annual Patron of Heritage awards today. These are a celebration of individuals, corporations and organisations which donate generously – in cash and in kind – to help the arts, culture and heritage thrive. It adds that “donations and loans fluctuate on a yearly basis due to situational factors”. The temple in Waterloo Street is a long-time supporter of arts and heritage causes. It is recognised for its cash donation to theAsian Civilisations Museum and The Peranakan Museum. The donations have also contributed to the building up of Singapore’s national collection and museum and heritage capabilities, all of which the heritage board says has “greater meaning as we celebrate Singapore’s 50th anniversary this year”. Among those being recognised are long-time donor Ms Agnes Tan, the daughter of prominent Straits Chinese community leader Tun Tan Cheng Lock. She has supported the NUS Museum by donating various objects to the museum’s Straits Chinese Collection, including portraits, furniture, porcelain, ceramics and an assortment of domestic utensils and display objects. The NUS Museum is managed by the National University of Singapore. Banyan Tree Holdings‘ senior vice-president Claire Chiang is also recognised this year for her cash donation to the Lee Kong Chian Natural History Museum, as is Dr Shahzad Nasim, group executive chairman of engineering and consultancy firm Meinhardt, for his cash donation to the Indian Heritage Centre. Another donor, Mr Hugh Young, managing director of Aberdeen Asset Management Asia Limited, is being recognised for his support to the Founder’s Circle. Through this, the National Museum of Singapore aims to cultivate patrons, who are champions for the museum. The Briton has lived in Singapore for more than 20 years and says that “it has been great to see museums here start coming to life and bringing that life to the people – no longer the rather stiff places I remember from 50 years ago”. Established in 2006, the Patron of Heritage awards aim to cultivate a pool of supporters for the museums and encourage others to be involved in adding to, treasuring and preserving Singapore’s unique heritage. Mr Tan, 60, has donated portraits of Tan Beng Chong and Yeo Swee Neo to add to the NUS Museum’s study of 19th- and early-20th century portraiture in this region. Tan Beng Chong was one of the founders of the Keng Teck Whay Association, set up in the 19th century by 36 Hokkien Baba merchants as a self-help group for business and family matters, and Yeo Swee Neo was his wife. He has grown up with both portraits that used to hang in the study of his grandfather’s house at Ayer Leleh in Malacca, Malaysia, “for as long as I can remember”. Tan Beng Chong (1799-1875) was his great-great-great-grandfather and the pair of portraits were handed down from one generation to the next. Mr Tan says that the date of the paintings is unknown and that they form an indelible part of his memory of his grandfather, a collector who also displayed in his study “the coffin to be used for his future funeral”. This was a common practice then. What is known is that Tan Beng Chong’s father, Tan Siang Long, settled in Dutch-occupied Malacca sometime in 1790 after trading as a merchant in Batavia (Indonesia) and Siam (now Thailand). “It is one decision I have never regretted,” says Dr Nasim, now 65. Tracking his own migrant’s tale and looking at some travellers’ tales showcased at the beautifully curated Indian Heritage Centre, he speaks of Singapore fondly as “a country that grows on you”. Dr Nasim’s cash donation has helped in the creation of a Mosque Facade, which is an integral part of the display. It is likely to be one of the most photographed and Instagrammed spots when the centre opens. The amount he donated was not revealed. The two-storey tiled Islamic facade features underglaze cobalt and turquoise blue on white slip and is from Multan, Pakistan. Dating back to the 1890s, it came partially assembled with some loose tiles. Conservators had to work on it like a jigsaw puzzle to recreate the appearance of what would have been the mosque’s facade. Its presence in the Indian Heritage Centre is a nod to the diverse cultures that make the South Asian community what it is. The centre has a floor area of about 3,000 sq m and five permanent galleries on the heritage of Singapore’s Indian community and its links to the global Indian diaspora. Dr Nasim lauds the team for the curation and presentation of the exhibits, calling them “immediately appealing”. The country’s first museum on the Indian community here is a fitting addition to “explain not just the cultural narrative but also to chronicle our early interactions as well as our many contributions”, he says. He adds: “You get automatically inspired when you walk in through the large door that leads you to this centre”. Dating to the 19th century, it has 5,000 minute carvings and presents the architectural style of South India’s Chettiar community, which had acquired wealth from their moneylending businesses across South-east Asia. As senior vice-president of Banyan Tree Holdings, Ms Chiang travels around the world to speak on issues she is passionate about. These range from sustainability and environmental issues, to books, to women’s representation on the boards of companies. This was what led to her donation to the Lee Kong Chian Natural History Museum. She receives the Supporter of Heritage Award given to donors who contribute between $10,000 and $49,999 for her contribution to the museum’s endowment fund. The amount she donated was not revealed. Her love for museums can be traced back to her visits as a child to the National Museum of Singapore. With a history dating back to 1887, it is the nation’s oldest museum and used to display natural history artefacts as well. She wanted to support the Lee Kong Chian Natural History Museum because she feels it offers the potential for Singapore to emerge as “a hub for exchange for world scientists, researchers and scholars to look at a whole range of issues ranging from our natural habitat to our rainforests to our bio-diversity. A museum is a starting point for these conversations”. “It is a tough challenge. We all know that we are often reaching out to the same pockets and… donors often like to support the needy, the elderly,” she says. The bright spot, she says, is that there is now “more sensitivity and understanding of arts, culture and heritage though these are not often the top causes we support”. She says: “I think we are already seeing that – a greater degree of involvement. ← LKCNHM Now Open to the Public!